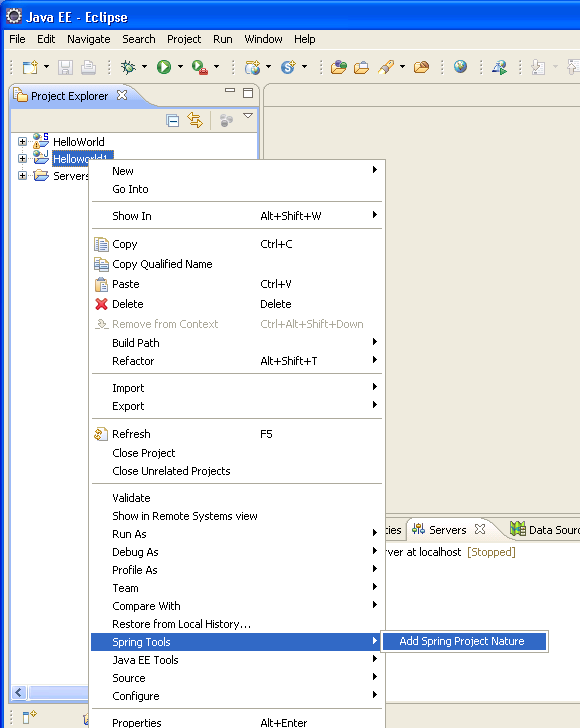 Develop Hello World example in Spring MVC. 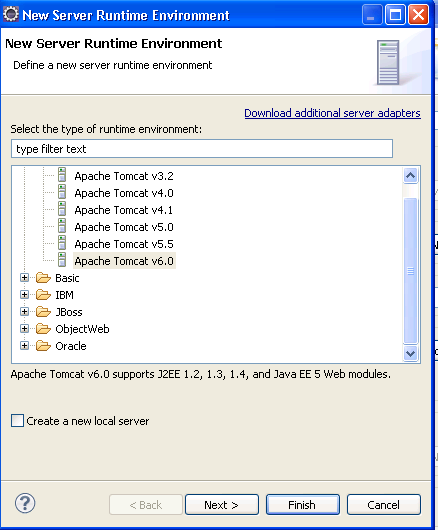 In this tutorial we will develop the Spring MVC Example and then run on the Tomcat server. We are using Spring 2.5 for this tutorial. We will also explain you the process of creating the dynamic web application in Eclipse IDE version 3.5.2. We will use tomcat to run the example. Eclipse provides the way to easily run the example from the IDE. 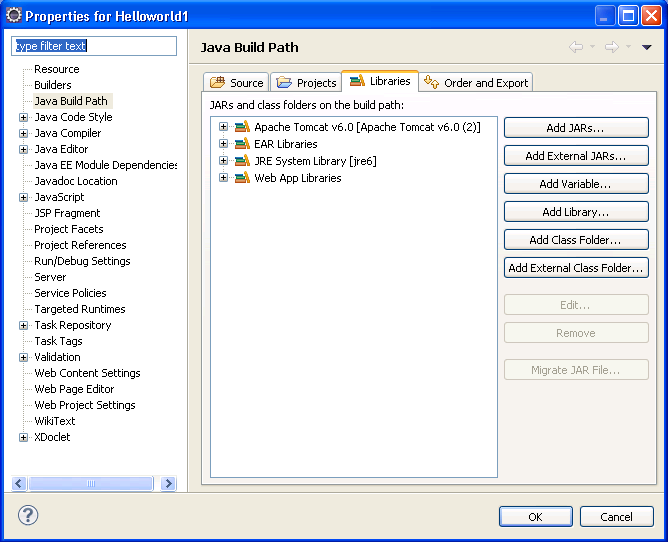 The initial step is to create Dynamic Web Project in eclipse. 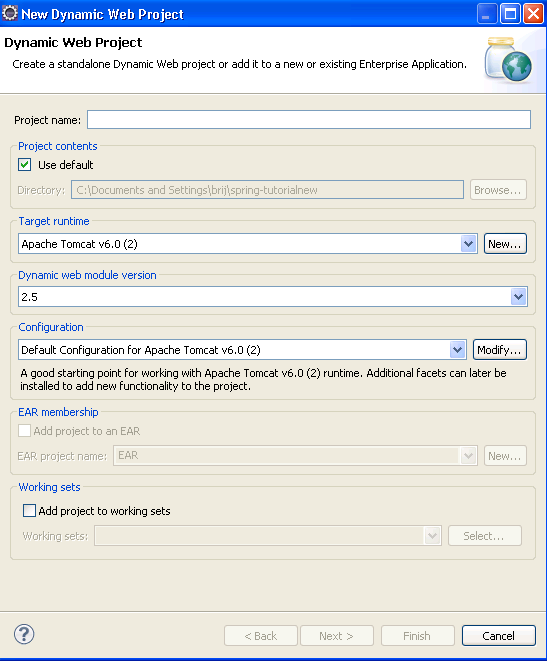 To create a new Dynamic project in Eclipse IDE select File -> Dynamic Web Project as shown below. After that New Dynamic Project Window will appear on the screen and you will enter the web application name in the Project name text box. Enter Hello World in the Project Name and then click Next button. 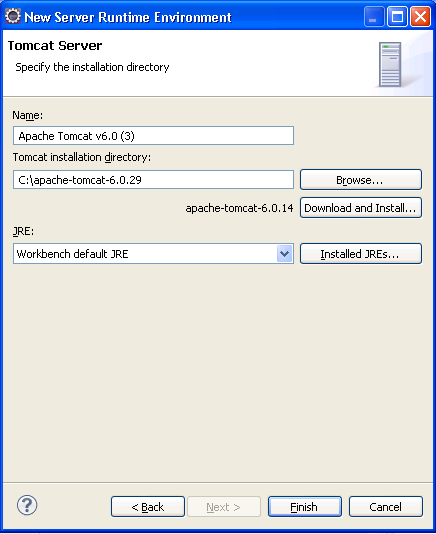 We will enter the project name and set the project location and set the target runtime (Apache Tomcat server) just click on New button after that a New Server Runtime Environment window will appear, select the latest version of runtime environment and click Next button and Download and install the Tomcat Server and click on Finish button and also click on Finish button in Dynamic Web Project creation window. After that we will set the nature of the project just right click on the project and select Spring Tools with Add Spring Project Nature. We will add all Spring Web MVC 2.5 jar files. After that we will select the Libraries tab and click on Add External Jars button for add jar files. After selecting all Spring 2.5 Web MVC jar file we will click on Ok button and jar files is appears in your project lib folder. 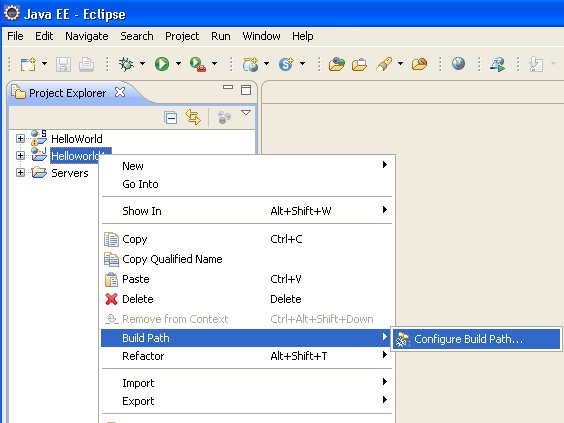 Now your project will created in Eclipse IDE. Now we will configure the DispatcherServlet in web.xml file. The DispatcherServlet will be configured to process all the request ending with .html. The view resolver looks for the jsp files in the /WEB-INF/jsp/ directory. Click on the "Hello World" link to test the application. It should display the "Hello World" message as shown below. You can download the code from the above url and then import the project in Eclipse IDE.